Description: Unknown date, and photographer. Description: MEC 374 waits arounds in Rigby Yard. Description: On NS 043 FEMA Express. Description: A Surprise on a NS Train! Description: MEC 374 is on NS train 351 at Greensboro, N.C. Description: EDNA heading north through Tyngsboro. Description: A pair of Guilford trains at "Wagon Wheel". Description: LA-2 returning to Lawrence after switching Praxair. Description: MEC 504 leads the way west through Pittsfield. 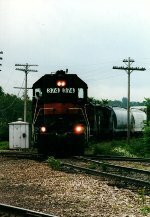 Description: A westbound train rounds the curve approaching Webb Road leaving the town of Pittsfield. Description: Westbound NMED approaches Snakeroot Road. 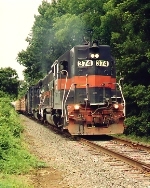 Description: A westbound freight train travels between Pittsfield and Clinton. Description: A train headed for Waterville from Northern Maine Junction closes in on Railroad Street in Clinton. Description: A westbound freight train crosses the Kennebec River. Description: A freight train crosses the bridge into Fairfield, Maine in the light of the setting sun. Description: Guilford/PanAm train MOED has just exited the East Portal of the famous Hoosac Tunnel in western MA on the way to East Deerfield yard.